Quarter and remove the stalks from the cabbage, then chop it into 4cm pieces and place in a large bowl. Sprinkle over 4 tablespoons of sea salt and massage it in with your hands. Cover the cabbage with cold water and sit a plate on top to keep the veg submerged. Set aside for 2 hours. Peel the garlic and ginger, then place in a food processor with the sugar and blitz to a smooth paste. Transfer it to a bowl and mix in the shrimp paste and gochugaru until combined. Matchstick the daikon and spring onions, then place in a large bowl. Squeeze out any excess water from the cabbage, then add it to the bowl, along with the gochugaru paste. Wearing disposable gloves, use your hands to mix it all together thoroughly. Spoon the kimchi into a large kilner jar and press it down so the juices rise, leaving a gap at the top, then close and seal the lid. Leave the kimchi to ferment at room temperature for 2 to 5 days (place the jar on a plate to catch any brine that might bubble over.) Check the kimchi every day, letting out some gas and pressing the vegetables down into the brine. When the kimchi tastes delicious, transfer the jar to the fridge. This will keep for up to 3 months. Korea’s national dish, kimchi is so highly regarded in the country that workers are given annual bonuses to enable them to make their own supply. 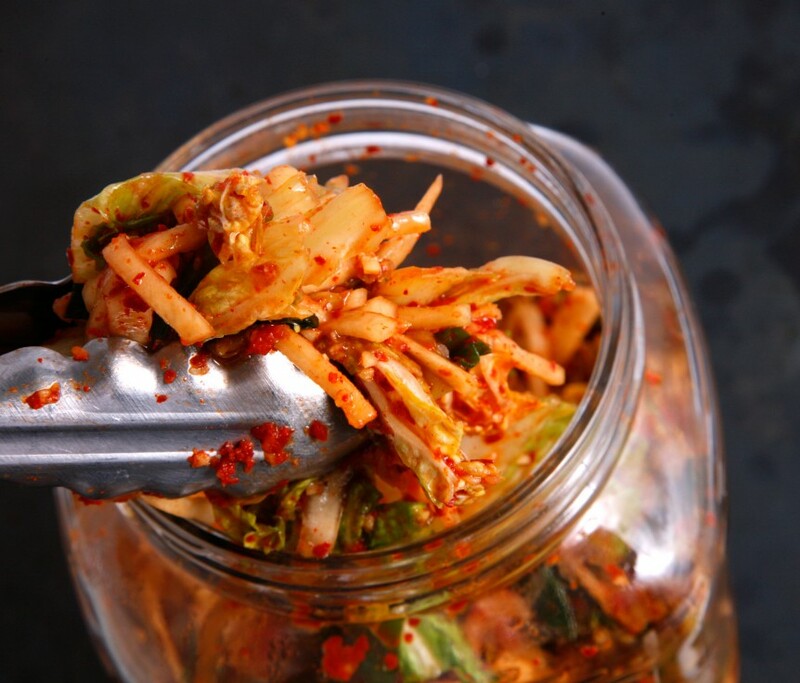 Kimchi is traditionally made with cabbage, spiced up with garlic, ginger and shrimp paste. It’s full of flavour, but what’s more, it’s good for you too. The cabbage is mixed with salt, which starts off the lacto-fermentation process, where naturally-occuring bacteria convert the vegetable sugars into lactic acid, a natural preservative. And, as beneficial bacteria thrive, eating it aids digestion. It’s so easy to make your own, and you can adjust the ingredients to suit your own tastes. Kimchi will last for up to three months in the fridge in an airtight jar.